We are running right along, looking at the appearances of the Flash in video games, as rare as they are. 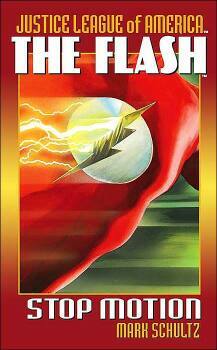 In review from Part 1, the Flash does not get to appear as the titular character in games anymore. He’s lucky if he’s even mentioned by name as a member of the Justice League. See this travesty. Today we are looking at the Flash in Justice League: Earth’s Final Defense, available on iOS and Android. Pictured Above: He even made it on the title screen! I’m so proud. I highly recommend Justice League: EFD for all you Android or iOS gamers out there looking for more Flash-action on their phone, perhaps in between your digital comic reading app and your digital copy of The Flash: Stop Motion. Pictured Above: The Great American novel. Don’t you laugh. 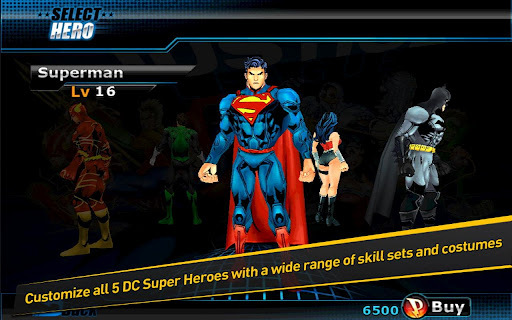 Justice League: EFD is a bargain and one of my favorite Android games. I don’t want to sound too much like an advertisement, but this game is only 99 cents and it’s awesome. You may not trust me, and that’s fine. I was hesitant to buy it as well. Currently, it’s not getting the best reviews on the Google Play store. The people that love it give it five stars, but most people are rating it one star because they either can’t get it to work or their in-game purchases aren’t processing. In the end, it’s averaging about 2.5-3 stars. If your phone is qualified for it, and not over-qualified for it in the case of some iOS devices, go check your couch for the pocket change you need and buy it here on Google Play or here on iTunes. But the story is not so good, either. 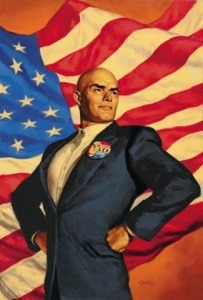 The first cut scene is Lex Luthor laughing, proclaiming all the Justice’s League base are belong to him. The game’s script was probably written in Korea after Geoff Johns gave an outline of what he wanted on a post-it note. Doesn’t matter. It’s a game where you’re the Justice League and you punch goons. Just make your own retcons where you need to: perhaps all the enemies can harm Superman because they’re using Kryptonite bullets. Doesn’t. Matter. Pictured Above: The JLA Trinity available to play right off the bat. If you want to play as those weird characters in the shadows on the left, however, you’re gonna’ have to earn it. For our purposes, you’re going to want to unlock the Flash ASAP. He costs 1,500PP, and you begin the game with 1,000PP. This means you either need to 1) cough up another 99 cents to get the PP you need through in-game store (which I would not recommend. It looks like you’re sending money to an unknown place, perhaps Apokolips, from which it may never return, and you may not get your points according to some angry customer reviews) or 2) play some missions as the other characters to earn PP legit, while learning the basics of the game. I went with route two, and was glad for it. Pictured above: Micro-transactions in games are where Lexcorp makes all its money. And that’s terrible. My favorite non-Flash character is Wonder Woman. She’s got a good balance of tankiness and damage, and her Lasso of Truth is a pretty neat toy that can keep your combos going. Still, like Batman and Superman, she feels a little clunky. And aside from a handful of skills, most of the “powers” in the game are brawl-style attacks. Literally, moves like “Kung Fu Kick” and “Double Punch” cost energy like you need to be a meta-human to perform them. Not the most imaginative use of intellectual property for characters that have such a range of powers and devices, including Bat-anti-shark spray. The game itself is a top-down brawler, and it may take some getting used to in terms of control. The game is controlled by attack buttons on the right, which govern your brawling and special skills, and a virtual analog stick on the left for movement. You’ll have trouble stringing your combos together initially if you’re only accustomed to console paddles, and you’ll need to play on Easy difficulty until your characters are leveled enough to play on Normal. Once you’re able, switch up to Normal to accrue PP faster, so you can unlock the Flash quicker. Pictured Above: The Flash, unlocked as a playable character. Notice your miniscule amount of PP in the bottom right, still taunting you so you’ll give up your credit card. For some, this might be tedious. For the action-RPG fans out there, you will love it, and you’ll just be glad it’s not your 1000th time killing Asmodan on Inferno difficulty for loot so someday, maybe, you can hope to kill Diablo. Simply put, Justice League: EFD is like Champions of Norrath and Final Fight had a baby. 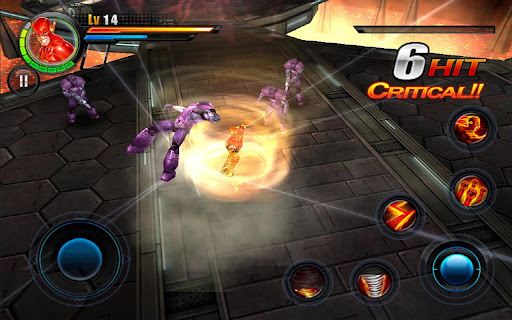 It’s Marvel Ultimate Alliance, but for $.99 on Android with better characters. And things really take off once you’ve got the Flash. The Flash is the best character, and I mean that aesthetically, mechanically, and in terms of overall fun. He moves faster and punches faster than the rest, and this is an achievement for a game. This is best illustrated through how he can “juggle” enemies better than the rest of the JLA. Whereas characters like Superman and Wonder Woman punt their enemies away at the end of their 4-hit punch combo because of their super-strength, the Flash is fast enough to follow up after his chain has ended and keep the combo going. This means he can get combos up in the 30-40 hit range fairly easily, especially combined with his super-speed powers that give him invincibility frames. For the non-gamer fluent out there, this might sound like gibberish. For the super-speed, Tekken fanboy/fangirl, this makes more sense than anything in the world. Ever. In other words, the Flash is fighting with super-speed, and it is genuinely done well and it’s very fun. Pictured Above: The Flash, making his enemies look like absolute garbage. Notice all the power icons available to him on the right. Each power is animated well, fun to use, and really distinguishes him from the other sluggish characters. The Flash’s powers include a two-hit pop-up uppercut-dash, a flurry of super-speed punches, a Zangief-style spinning grapple, zipping around the map hitting multiple enemies, spinning around like a whirling dervish, and entering Bullet-Time as an ultimate attack. When all combined together, you’ve pretty much got the authoritative version of the Flash in a video game. It scratches all the itches. He makes his enemies look like chumps. He comes off as bulletproof. You really get the sense he’s more powerful than the whole JLA combined. I love it, and I was bummed the hard level-cap in the game is Level 30. I would play this Flash character until Level 99. Replaying levels, however, on Hard Difficulty with the Flash to earn PP and support characters gives the game some good longevity. Also neat are the additional costumes available. When you’re racking up the PP with the Flash, you can unlock his classic red costume, his Blue Lantern appearance, or Barry Allen in a lab coat. 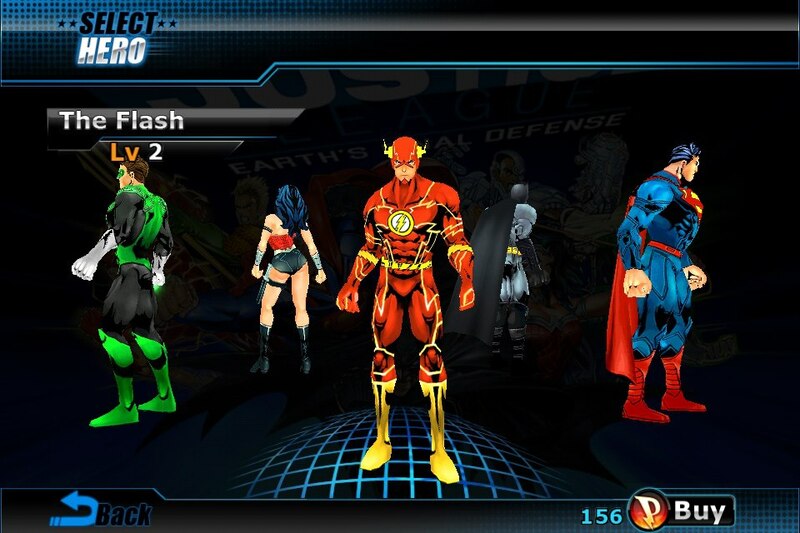 These costumes give special bonuses, which help you “customize” your Flash to a certain playstyle. 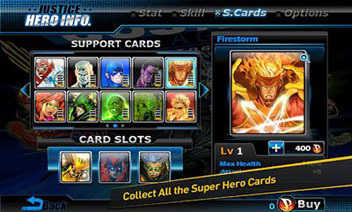 You can also collect certain other DC characters as “cards,” like Captain Atom, Deadman, Static Shock, etc., for other passive bonuses to your character. You might outfit your Flash as an invincible dodge-tank, or maybe a critical hitting DPS-monster. All things are possible, and you can respec your Flash with the right amount of PP so you’re never married to a build. Again, gibberish to some, coolest thing ever to others. Pictured Above: Some of the Support Characters you can collect, if you play through the game with characters other than the Flash. As such, I have not collected many Support Characters. I really appreciate Justice League: EFD for its “diamond in the rough” qualities. On the surface, it looks sucky, it’s micro-transactions look shady, and there’s very little Justice League in it for a game called Justice League. If you dig deep, however, you will find a playable Flash character that really touches the Speed Force. If you go in with low expectations like I did, having spent a whole dollar, you may be pleasantly surprised. Contact with questions and comments at colin.crebs@law.utah.edu. This entry was posted in Media and tagged Games, Guest Posts, Justice League: Earth's Final Defense, Video Games on March 4, 2013 by Guest Blogger. Yes, a thousand times, yes. Funny I never put the fact that I was a Tekken fan and Flash fan together. Great review! The problem with the flash is that it won’t work on iPads. Please tell me you intend to review the Game Boy Advance Justice League Heroes: The Flash game… best Flash game I have ever played, easy!